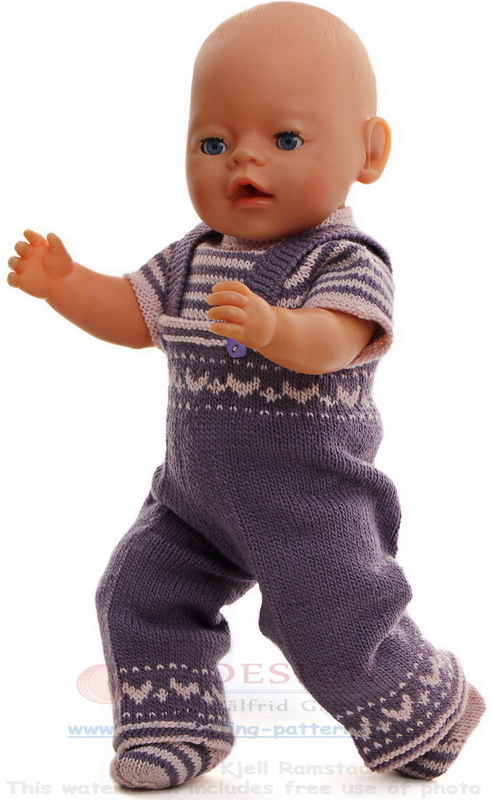 I was looking for inspiration to design for my doll. Then I remembered I had some lilac and pink which looked beautiful together. 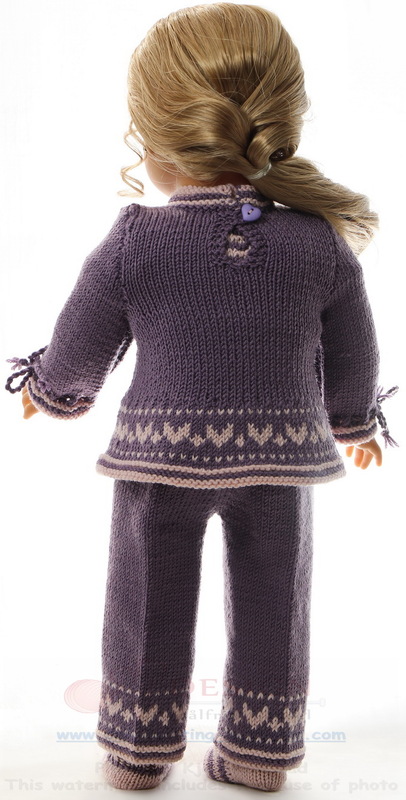 Therefore, I decided to design some everyday clothes for my dolls. I thought that a tunic would be nice for this ensemble. The finished tunic looked very nice indeed. I knitted the edge in lilac followed by pink garter stitch and was delighted at how well these colors complemented one another. Hearts made this tunic really cute. The tunic is buttoned at the back with a little heart button. Cast on 120 sts in pink and knit 1 row. Change to lilac and knit 2 rows ga. Change to pink and knit 2 rows ga. Continue knitting in the round and knit 2 rows st st in lilac before knitting pattern A (See diagram). Continue knitting in lilac and knit 2 rows st st. On next row decrease every 3rd sts = 80 sts on row. Continue knitting st st until work measures 11 cm before casting off for the armholes like this: Cast off 3 sts, k34, cast off 6 sts, k3. Continue knitting front and back separately. Front: Purl next row. On next row decrease 1 sts at each side and continue knitting st st until work measures 17 cm. On next row decrease the 10 center sts for neckline and knit each side separately. Decrease 1,1,1 sts along the neckline every second row. Knit 3 rows st st and put shoulder sts onto a cable ndl. The other side is knitted in the same way with decreases on the other side. 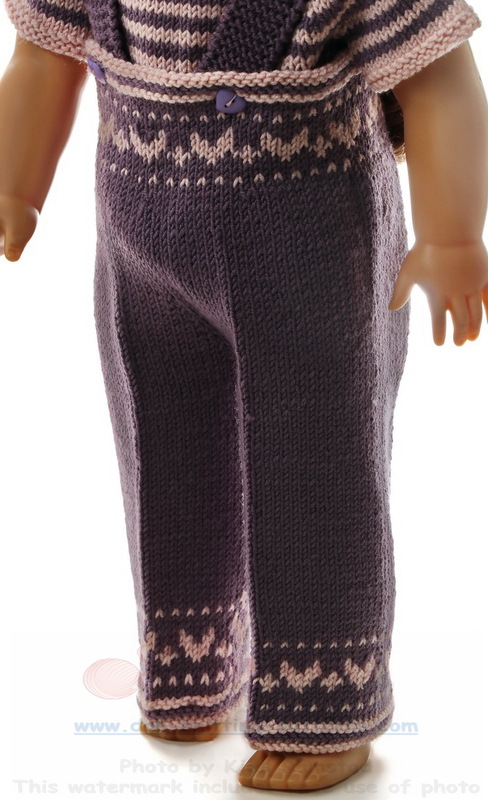 The pants were knitted in lilac to match the sweater. They had striped edges with a beautiful heart pattern around the waist and legs. 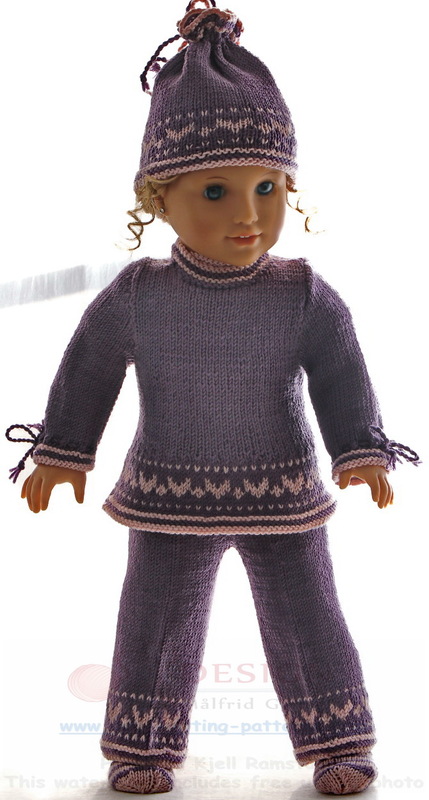 The pants are kept up with garter stitch suspenders/braces and the front is buttoned with small heart buttons. A short-sleeved jumper was a great accessory for the pants. 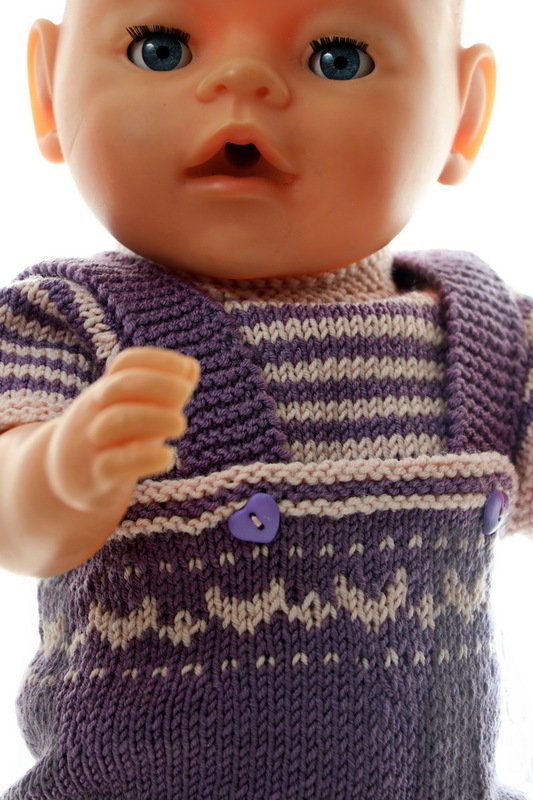 This jumper is knitted with stripes in lilac and pink. 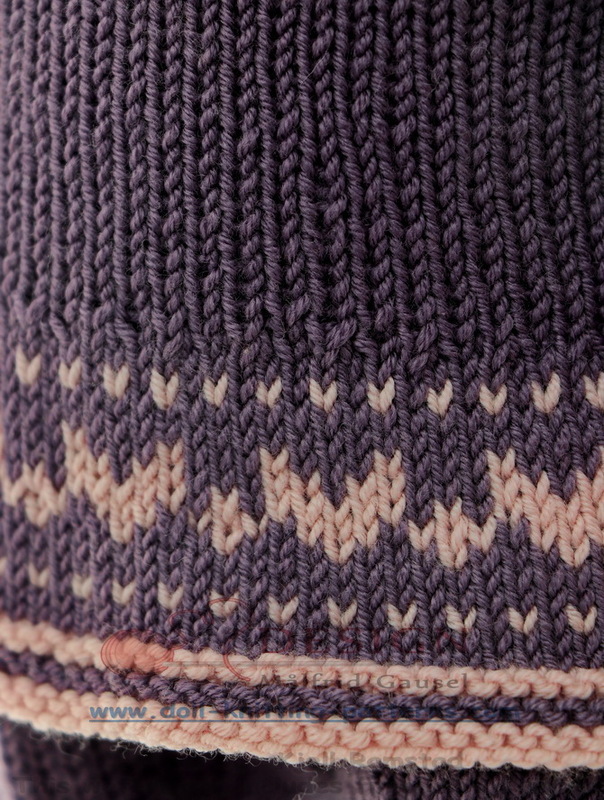 Cast on 80 sts in pink and knit 9 rows ga. Continue knitting st st and knit the sts onto 4 double pointed ndls or a circular ndl and continue knitting in the round. On next row increase 8 sts evenly across the row = 88 sts in total. Continue knitting stripes, 2 rows pink, 2 rows lilac alternatively until work measures approc 9 cm. On next row do the following decreases for the armholes: Cast off 3 sts, k38, cast off 6 sts, k38, cast off 3 sts. Put work aside and knit the sleeves. Sleeves: Cast on 40 sts in pink and knit 1 row. 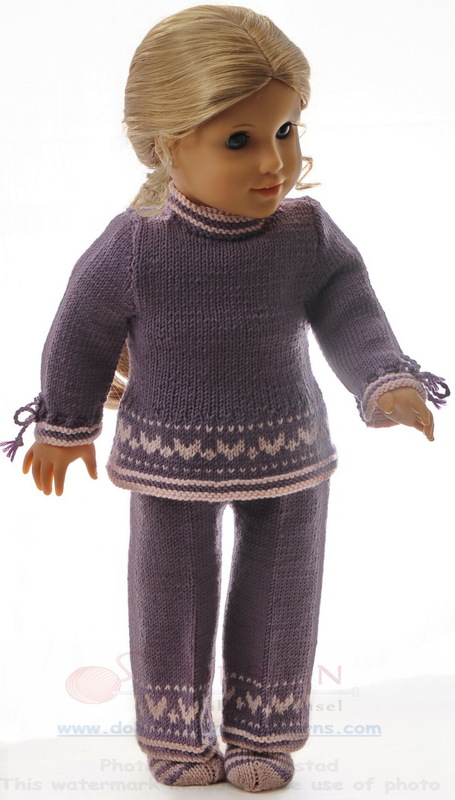 Change to lilac and knit 2 rows ga. Change to pink and knit 2 rows ga, 2 rows st st. Continue knitting 2 rows lilac, 2 rows pink alternatively 6 rows altog. On next row cast off 3 sts at the beginning of the next 2 rows. Take care that the stripes end the same way on the sweater and on the sleeves. 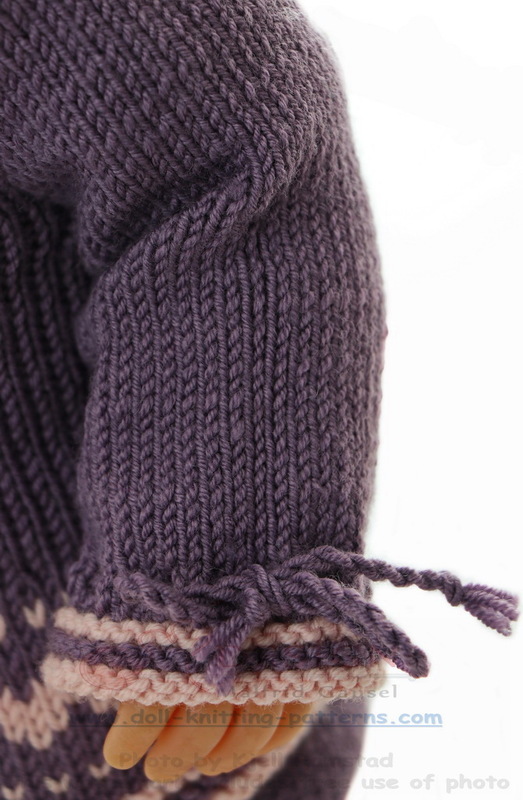 Knit the sleeves onto 1 ndl like this. 1st sleeve, front, 2nd sleeve, back. 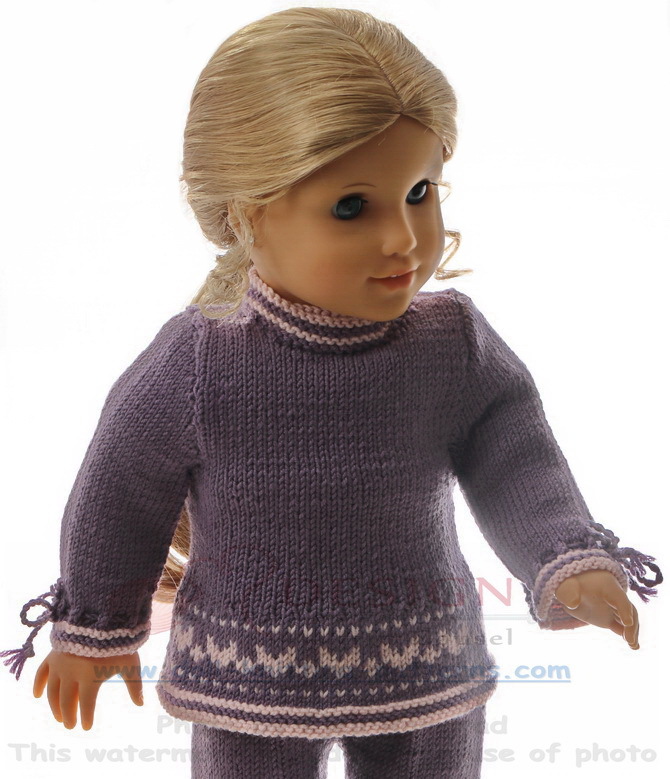 The edges and neckband are also knitted in pink. To finish off the outfit a cap was the perfect item. This cap has the same heart pattern as the tunic and pants. Finally we needed a pair of socks. 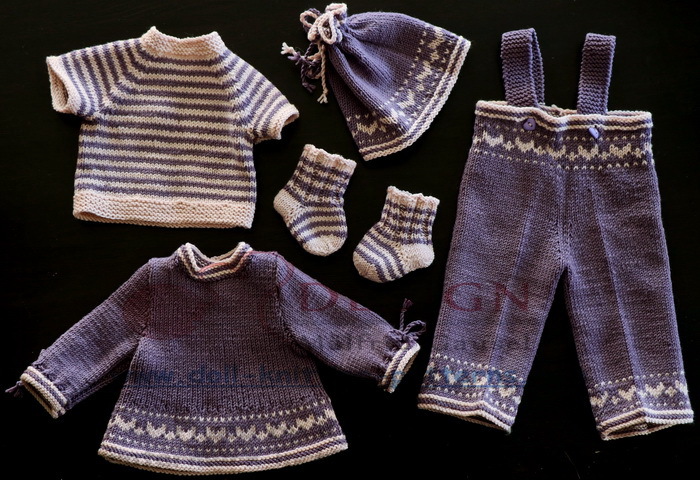 They are knitted in lilac and pink stripes. 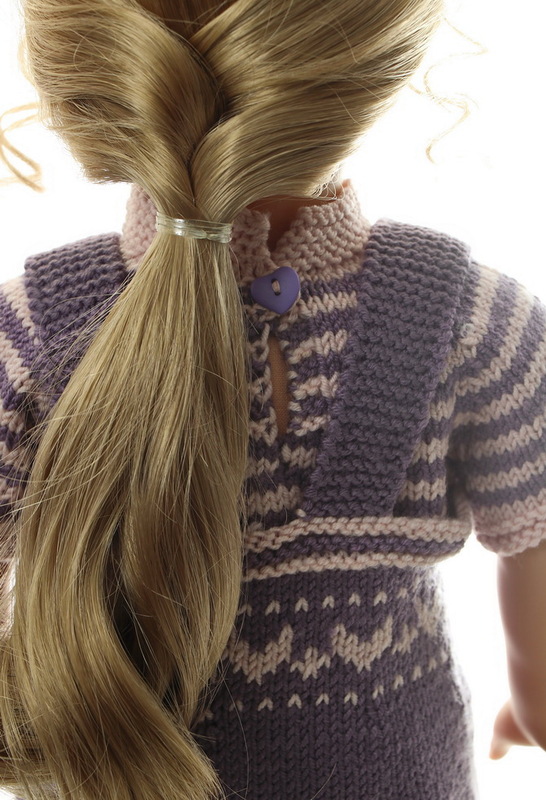 The top is bound together with 1 lilac and 2 pink chord and held together with a bow. 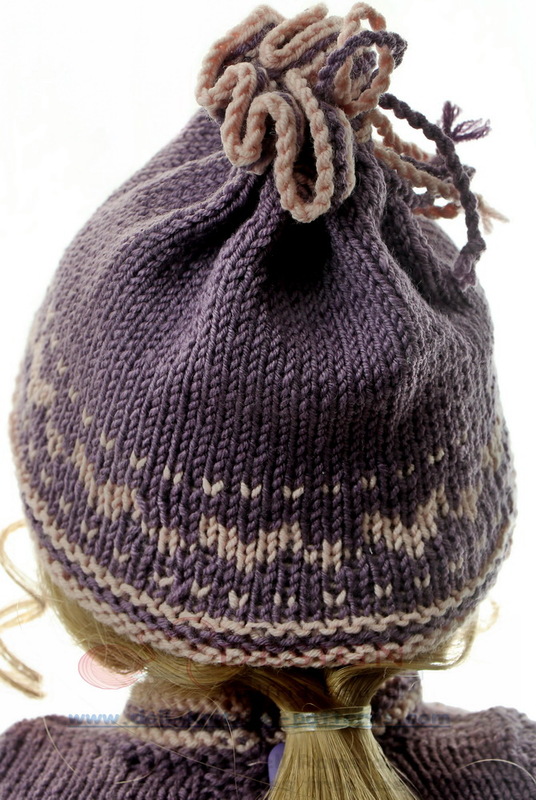 The edge around the top is knitted in stripes in garter stitch. I know that you will like these clothes. Enjoy your knitting!